Kaleidoscope will be the very first full-color show by Silverlens Gallery. 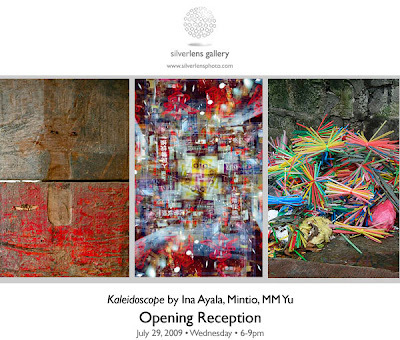 The show is a mix of three artists, Ina Ayala, Mintio and MM Yu, with very different perceptions of space and reality. The show captures the polychromatic urban soul through Ina Ayala’s painterly abstractions, Mintio’s explosions of light and MM Yu’s street documentary style. Ina Ayala, a painter and photographer, delivers a fresh and curious approach, as she captures the textures and discolorations of things time left behind. She collaborates with nature and photographs its effects on urban detritus, as a result, producing rich nostalgic images reminiscent of modern paintings. Mintio is young, vibrant, up and coming photographer from Singapore. She takes snippets from urban scenes as she travels Asia and blows them up into fragments of light and color in an organized space. She reflects each image evenly within the frame, much like a kaleidoscope, blurring the starting and ending points of the frame, producing a new cohesive abstract image. Each of her frames is attuned to light, color and the ostensible geometry of her environment. The images are visually astounding from afar and sustain awe as the viewer is drawn closer to see the minute details of her layered photographs. MM Yu, is essentially a photographer and a visual artist. The CCP Thirteen Artists Awardee, makes apparent the whimsical happenstance of urban Manila. She draws us to see the remarkable bursts of color amidst the concrete maze of the city. MM retains a sense of humor capturing coincidental curiosities and instances that are intrinsic in the local culture. Kaleidoscope reveals the patterns and textures that make up the vivid cityscape and divulges each artists’ intimate and personal perception of reality. Kaleidoscope will be shown alongside Dead Ends and False Starts by Mariano Ching at SLab and Land of Promise by Gail Vicente and Marija Vicente at 20Square Gallery.